This was used in the 2011 remake. This was of the few practical makeup effect that made it to the film. This was seen through a ice block in the film. This is the prop inside. Eventually the ice block melts then the alien escapes. This is the full scale dummy. The paint initially was basic being seen through the ice block. So after the film Fx artist punched up the paint for display as well as making a table and foam ice to complete the display. Now it is a complete awesome display! Last picture shows how it was used and making of it. IT is 6 foot long and 3 foot wide. Tall from bottom of table legs to top of alien. The Alien could be removed if so desired from the table display. I bought directly from the FX studio! 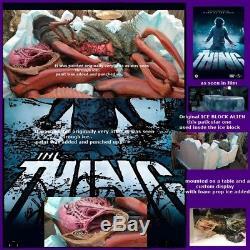 Great addition to any movie props collection or great for Halloween haunts! 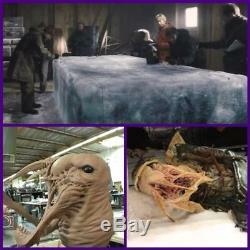 The item "The Thing Bottin screen used movie prop Prequel monster horror prop Halloween" is in sale since Thursday, January 10, 2019. This item is in the category "Entertainment Memorabilia\Movie Memorabilia\Props\Originals". The seller is "bloodbayouwwe" and is located in Burbank, California. This item can't be shipped, the buyer must pick up the item.